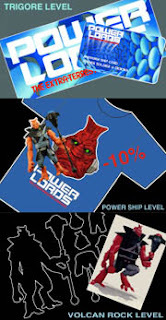 The long-promised Power Lords Fan Club is up for ordering! Source Horsemen has the full details, but here's the really short version, followed by the short version. Shipping is $12 extra on all levels - even the $20 level. Level 2 is arguably the most compelling with an exclusive figure - but US residents will have to shell out a whopping $72 to get this one. There are three levels, and shipping is not included. If you want a figure, a shirt, an early order window, and a discount, it's $60 (+$12). If you want some paper stuff and the early order window, it's only $20 (+$12). If you want signed art and a whole mess of stuff, it's $100 (+$12). It may be worthwhile for the discount. The membership lasts one year, and nobody is sure how many figures will be made in that first year. Also, how badly do you want that exclusive Ggrabbtargg?